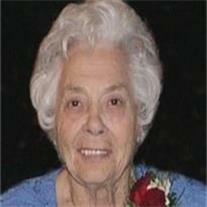 Jewel LeMay Leslie, 90, from Showlow, AZ, passed away March 8, 2013 in Mesa, AZ. She was born April 7, 1922 in Floydada, TX to Roger Fenton LeMay and Atoka Lee Parrish LeMay. She is survived by her husband of 68 years, James W. (Bill) Leslie; they have three daughters Diane (deceased), Cheryl (Randy) Walker, Denise (Don) Packer, 10 grandchildren and 19 great-grandchildren. Funeral services are Wednesday, March 13, 2013 at 11 AM, preceded by a visitation at 10 AM at the LDS Chapel at 940 E. Southern, Mesa. The family would like to thank Hospice of the East Valley for the wonderful care that was given to Jewel. Arrangements by Bunker’s Garden Chapel.